This tour includes shuttle pickup from your hotel and begins with a 35 min ride to the Hoover Dam bypass bridge where you will enjoy a 30 min stop with a brief walk out to the bridge for a photo opportunity. Then a short drive to our Outdoor Adventures base before boarding one of our state-of-the-art helicopters. Soar above the Grand Canyon and descend 3,200 feet to our private landing area for a champagne toast. Return to the base for a meal before your drive back to Vegas. Soar through 20 miles of the magnificent Grand Canyon. 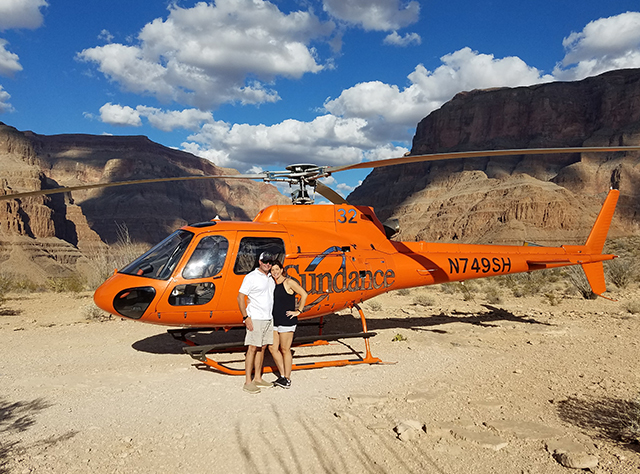 This Sundance helicopter tour includes Complimentary shuttle pick-up and drop-off at your Las Vegas hotel, 15-minute photo opportunity on the O'Callaghan-Tillman bypass bridge overlooking the iconic Hoover Dam, Colorado River, and Lake Mead. Panoramic aerial views of the Mojave Desert and the Grand Canyon in a state-of-the-art modern helicopter, Lunch inside the world-famous Arizona Last Stop restaurant.